I love white wines, maybe it has something to do with the temperature it's served at. And if there are some bubbles in it, even better. 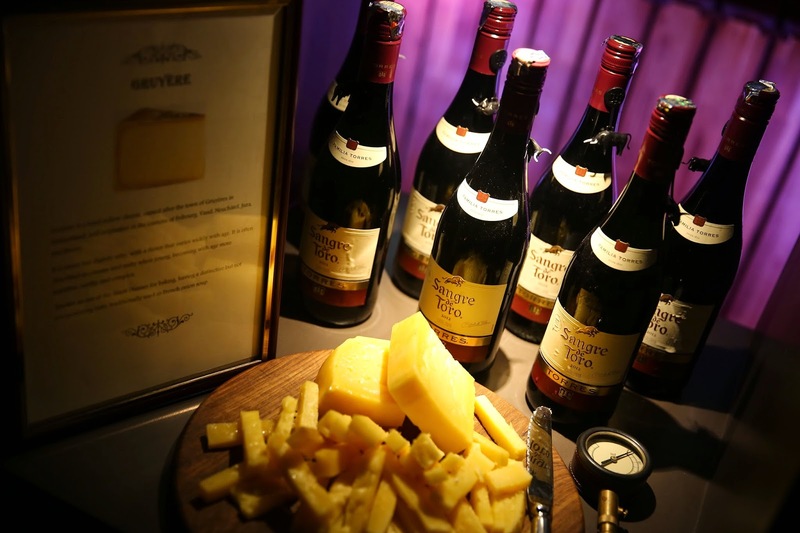 However, for this review at the Park Hyatt, as part of the ongoing Masters of Food and Wine Season 3 series, I had to foray into more unfamiliar territory and deal with a couple of reds as well and wine's popular pairing- cheese. I'm no wine connoisseur, and so this review is only about my impression of the wines I tasted and of course, the cheeses. The Terrace Deck of the Dining Room was set out with wine and cheese stations; at the centre, a large table piled high with breads, lavash sticks, green apples, grapes and figs, jars of mustard, dry fruit and delicious preserves. Refreshing the palate between wine courses is indeed serious business. The wines were from France, Spain and California, the organic and artisanal cheeses from Mango Hill, Pondicherry. We started with Laroche Petit Chablis. A pale, lemon coloured Burgundy, it tasted fresh, fruity and had a slight hint of acidity. A perfect aperitif that whetted the appetite. It was paired with La Buchette. I do like blue cheeses but this one had a slightly chalky aftertaste. Moving on to Vinasol Torres, a product of Spain, I enjoyed the crispness of the sauvignon blanc. Clear and lemon coloured, the wine was acidic, yet fresh and fruity with quite a lively character and a wonderful fragrance. If you like Boursin, then you will like Borsalino, Mango Hill's take on the soft cheese. Made of cow's milk, it had flecks of coriander leaves and spicy notes from green chilli. Delicious on its own or smeared on a slice of bread. For me, the dark ruby Sangre de Toro was Spain in a bottle. One sip of the slightly dry wine and I could feel my taste buds do the flamenco in my mouth. The flavours were complex with hints of spices and berries. The wine expert beside me explained the role a bit of bright sunshine plays in developing the bouquet in a wine. Paired with batons of Gruyere cheese, the combination was fabulous. But then again, I'm partial to Gruyere- love its savoriness. Conversation flowed and it was nice to hear what the others thought of the wines. By now, I was in a happy place and decided to try out some of the breads. Back to the tasting, Zinfandel is made from a variety of grape that has a dark skin. This offering from Ravenswood was a smooth wine with full bodied flavour. It tasted of raspberries and blueberries and had hints of spice. Sharing space with this wine from California was Le Pondicheri, a curry leaf crusted cheese. The cheese was tasty, the curry leaf flavour was barely perceptible but a good combination with the wine. Even wine tastings finish on a sweet note. Torres Floralis Moscatel Oro is a Spanish dessert wine made from Muscat grapes. Served chilled, the wine was a beautiful golden yellow, intense, aromatic and exuded the scents of rose and orange. I found it far too sweet, though I would have loved to have used it in a dessert. And with it, Camembert, a washed rind cheese made of cow's milk with a pale, creamy interior and a white rind. It was easily one of the best cheeses of the night. All in all, an enjoyable evening spent sipping fine wines and nibbling on some great tasting cheeses.